Kuala Lumpur has recently been ranked as 9th most visited city in the world (as reported by CNN and according to a global market research firm, Euromonitor International). The photo used in the report is that of the city skyline with the focus on Petronas Twin Towers, the world’s tallest towers from 1998 to 2004. The towers, still the world’s tallest twin towers to date, have become the landmark to represent the city and the country ever since its completion, and rightly so. 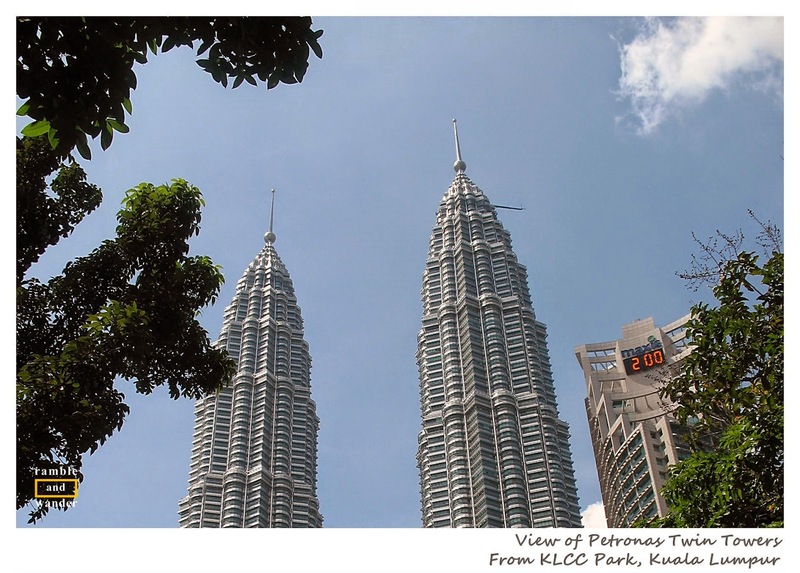 No visit to Kuala Lumpur would thus be complete without a visit to the twin towers, or KLCC (an acronym for Kuala Lumpur City Centre), as the area it is located in is known as. While a tour up one of the towers might cost some money, there are still some free things to do while one is in the area. One option would be to visit Galeri Petronas that is located on the 3rd floor of Suria KLCC. If one however doesn't feel so artistic, another option could be a stroll in KLCC Park, enjoying the green lung of the area that is now surrounded by high rise buildings sporting a quite interesting mixture of architecture. Another one would be to watch KLCC Lake Symphony musical water fountain show. Not many – Malaysians included - actually have heard about this musical water fountain show. While there are water fountain shows almost throughout the day, musical fountain shows only happen in the evening. There are of course many other shows with different songs & musical arrangements. Which one is your favourite? Mine is Situasi by Bunkface! :) Cindai by Siti Nurhaliza however proves to be quite popular based on the number of views. Enjoyed this musical fountain shows? You might also want to watch Dubai Fountain Show. Following a query at the Suria KLCC information desk and based on observation over a few days, it is noted that musical fountain shows start at 7 p.m. daily and play 2 songs/musical arrangements every half an hour until 10 p.m. I love that too! Just wish that I had captured the sound better from that side of the lake. Incredible! I didn't know the Petronas Towers the tallest twin towers in the world! They're some of my favorites...so beautiful. Awesome videos! That show looks amazing. 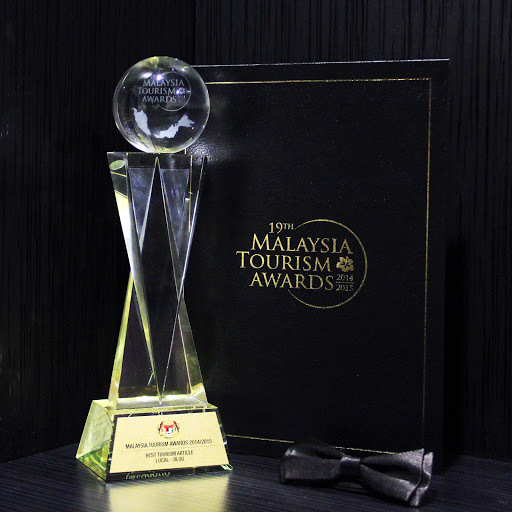 All the more reason to visit Malaysia. It is on the list. Those show looked spectacular - I hope I get to see one the next time i visit KL. Although I've never been to Kuala Lumpur, the Petronas Twin Towers have a special place in my heart because I love everything their architect, César Pelli, designs. Oh, yes, Ana! César Pelli's designs are really interesting. Great thing his design of the Twin Towers was chosen for this Petronas project for their HQ. I liked contradanza by Vanessa-Mae. These were fun to watch. 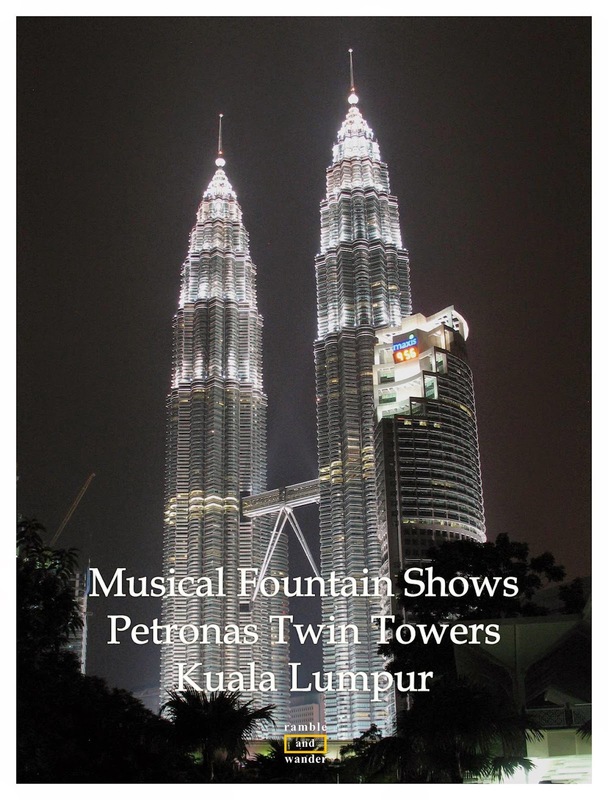 I can't wait to go to Malaysia this year and see the Petronas towers and these fountains for myself! Yes! I like Contradanza too, Brenda. Somehow it reminds me of the Braveheart (and consequently my time in Scotland years ago, heh!). When exactly are you heading this way, by the way? That is very similar to the Bellagio fountain show in Las Vegas. Thanks for the tip!! We are flying to Kuala Lumpur next week, I didn't know about the Fountain Show!! Managed to bring our CS friends to watch this Water Fountain Show last Tuesday. Amazing! It was our first time. Hahaha. But without that Situasi by Bunkface. wahhhhhhhhhhhhh!!! nice touch with the video clips!